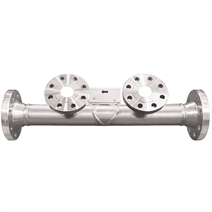 The model FLC-WG wedge flow meter consists of a pipe inside which a v-shaped wedge is fitted. Through this constriction, a differential pressure is generated which is dependent upon the volume flow. Due to its design, the wedge flow meter is suitable for nearly all types of flow, especially for media with a very low Reynolds number of 300 up to very high Reynolds numbers of several million. As a result, the wedge flow meter is very well suited for the measurement of slurries and highly viscous media (e.g. wastewater, sewage sludge, tar sand, cement ...) as well as gases and vapours. The design of the wedge flow meter is extremely robust against particle-laden, erosive and abrasive media. The constructional design of the wedge flow meter enables bi-directional measurement, which differentiates it from other flow meters. As standard, there are four different H/D ratios to select in order to cover a multitude of flow rates.